Green Key Weekend was originally a junior promenade dance prepared by the Green Key Society, a junior service organization that plays various roles in Homecoming, Orientation, and Commencement. However, today, the Society plays a minor role in the weekend, an annual program that features live music throughout the weekend on the Collis Main Stage and includes other great ways to celebrate the arrival of spring. This year for the first annual #GreenKey photo contest we want to see what makes you smile during Green Key. Is it the music, the food, the games, the friends and comradery, or maybe something else entirely? Show us! The next best thing to being at Green Key is seeing others enjoying the weekend. To give you some incentive to share your favorite photos with us we’re giving away some awesome prizes! Upload a public photo to the Dartmouth Co-op Facebook page. In the photo description you MUST tag @DartmouthCoop and use the #GreenKey & #DartmouthCoop hashtags. You may include any additional descriptions. Upload a public photo to Twitter. In the photo description you MUST tag @DartmouthCoop, and use the #GreenKey & #DartmouthCoop hashtags. You may include any additional descriptions. Upload a public photo to Instagram. In the photo description you MUST tag @DartmouthCoop and use the #GreenKey & #DartmouthCoop hashtags. You may include any additional descriptions. 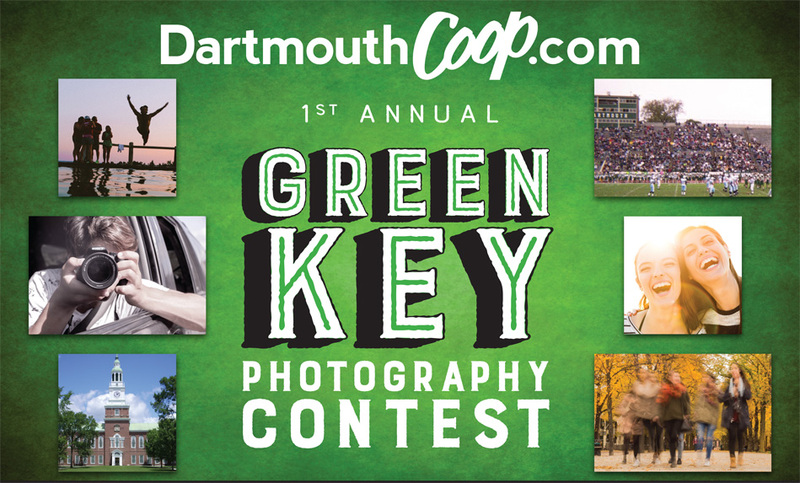 You may also directly email photos to greenkey@dartmouthcoop.com. Enter #GreenKey in the subject line and you may included any additional descriptions. Everyone who enters will receive a $25 coupon towards a purchase of $100 or more on DartmouthCoop.com. Participants who enter via email will automatically receive an email with a coupon. Those who enter through social media will be contacted within 24 hours of their time of entry with a coupon. Now that you’ve entered share your photos with your friends! The whole point of this contest is to show everyone how much fun we all have while skiing, so there’s no point in keeping it to ourselves. Every week we’ll send out a newsletter with some of our favorite entries. Will yours be included? After the 4 week long entry period there will be a two week-long public voting period. This is an IMPORTANT STEP! The photo that received the most votes between May 11 to June 19, 2017 will win one of our grand prizes! (See below) Make sure to share your photo with your friends and ask them to vote because there’s a huge prize package on the line! Our judging panel will announce the winners of all ten category prizes and the “Best in Show” prize, as well as the “Most Vote” winner on July 14, 2017. Our panel of judges has specific criteria we’ll be looking at to determine prize winners. See official contest rules for details and full judging criteria (it’s all based on having fun at Green Key). We have ten categories to award prizes plus a “Best in Show” prize. Including the “Most Votes” winner, that’s 12 chances to win! You DO NOT have to choose a category when submitting a photo. Your photo(s) will be automatically considered for all categories including Grand Prize categories (see contest rules). The winners of each of the categories and the “Best in Show” grand prize category will be chosen by a judging panel made up of the staff of the Dartmouth Co-op. The judging process will be 100% anonymous to eliminate any biases, etc. There are prize packages for each individual category as well as two grand prizes. The category prizes are made up of a selection of products from our sponsors and each category’s specific prize package will be announced on Friday 6/30/17. The information will be updated on this page. Winner will receive a Dartmouth Camp Chair. Winner will receive Dartmouth Tumble Tower. Winner will receive Dartmouth Dog Collar and Leash. Winner will receive Winter Carnival Poster Pillow. Winner will receive Dartmouth Ogio Covert Backpack. Winner will receive your choice of a Framed Winter Carnival Poster. Winner will receive Lone Pine Necklace, Bracelet and Earrings. Winner will receive Dartmouth Corn Hole Boards. Winner will receive Dartmouth Estate Chair. Winner will receive Dartmouth Lighted Sign.